The common place to get info for WinAPI is Microsoft's MSDN library MSDN library. There you will find all info concerning WinAPI programming. What is missing there are the actual values of WinAPI constants. You might find them already defined in the WinApi32.apl which can be downloaded from the Wiki main page. You can also use these very handy tools, named ApiViewer and ApiGuide. With this tools you can search all WinApi constants. You can download it here : ApiViewer and here ApiGuide. The constants found there are in VB or C syntax. You will have to define the constants in TD by changing &H to 0x. The operating system defines an application hang as a UI thread that has not processed messages for at least 5 seconds. Obvious bugs cause some hangs, for example, a thread waiting for an event that is never signaled, and two threads each holding a lock and trying to acquire the others. You can fix those bugs without too much effort. However, many hangs are not so clear. Yes, the UI thread is not retrieving messages - but it is equally busy doing other 'important' work and will eventually come back to processing messages. However, the user perceives this as a bug. The design should match the user's expectations. If the application's design leads to an unresponsive application, the design will have to change. Finally, and this is important, unresponsiveness cannot be fixed like a code bug; it requires upfront work during the design phase. Trying to retrofit an application's existing code base to make the UI more responsive is often too expensive. The following design guidelines might help. ... but if application still going into "Not responding state" there is an option to switch off that unwanted behaviour with user32.dll function DisableProcessWindowsGhosting() which has no return value and also not any parameter. Description: function disables the window ghosting feature for the calling GUI process. Window ghosting is a Windows Manager feature that lets the user minimize, move, or close the main window of an  application that is not responding. If you use Windows API functions to draw custom stuff on your GUI's for example it is very important to release or destroy created handles. Without this, the resources can diminish up until severe (painting) errors occur. An easy way to detect those memory leaks is using tools to monitor the amount of opened handles. Having a window handle, use the WinApi function IsWindow to determine if it is present in the system and corresponds to a valid window. Beware : this function checks if the window handle is valid, but it does not mean the window handle is the one you have created earlier. Window handles are reused in Windows, so the window handle could correspond to another window. To get high performance while filling a string with a specific character, use RtlFillMemory. With large data, this function is significantly faster than any SAL implementation. Applications build with Team Developer (prior to version 5.1) are not 100% compatible with the Windows themes (available from Win XP). Some GUI objects are painted using the selected theme and some are not. This could look ugly and not very consistent. In some cases it could be better to force the application to disable themes all the way. Beware : only the special painting of objects are disabled, not the sizes and colors of the GUI objects. This will disable all custom theme painting by Windows within the application. Beware that this approach disables an application from running on OS < WinXP due to the absence of uxtheme.dll on these OS. 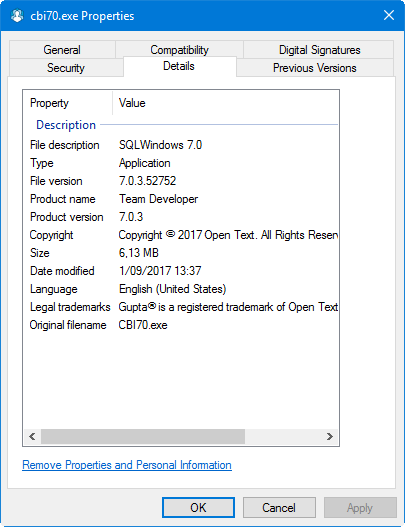 Perhaps it is an option to have a faked uxtheme.dll to be installed with the application. Another way is to determine which Windows OS the application is running on and based on the OS call the API function or not. 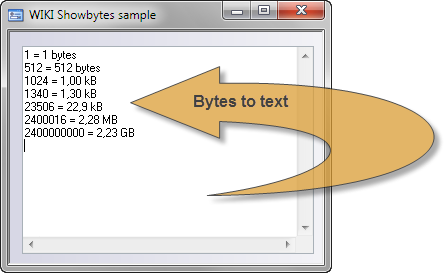 a formatted string presenting a number of bytes as bytes, kilobytes, megabytes and gigabytes.
! sBuf = "22,9 kB"
a formatted string presenting a number of milliseconds as seconds, minutes and hours. It will be formatted against the current locale. For instance English will be "hour", Dutch will be "uur".
! sBuf = "1 min 14 sec"
The WinApi function GetUserName can be used to get the current Windows logon user. (Implemented as GetUserNameW (Unicode) and GetUserNameA (ANSI)). We all have done file and path handling in one way or another, putting backslashes to folders or stripping extensions for example. Windows API gives us quite nice pre-build functionality, so that could save us reinventing the wheel in SAL. Below a list of handy functions. They are all put together in two TD libraries for both ANSI and UNICODE. (UNICODE version is for TD5.x and higher, the ANSI version is for pre TD 5.x versions). You can download the library and a small test application from the sample vault. Click on the function names to get more information and requirements. This results in correct syntax for a path. If the source path already has a trailing backslash, no backslash will be added. If there is already a file extension present, no extension will be added. If the pszPath points to a NULL string, the result will be the file extension only. If pszExtension points to a NULL string, an ".exe" extension will be added. This function automatically inserts a backslash between the two strings. Only if one is not already present. This function allows the user to specify what to remove from a path by inserting special character sequences into the path. The ".." sequence indicates to remove the path part from the current position to the previous path part. The "." sequence indicates to skip over the next path part to the following path part. The root part of the path cannot be removed. A prefix is one of these types: "C:\\", ". ", "..", "..\\". The '/' separator will be used instead of '\' if the original string used it. If source path points to a file name that is too long, instead of a path, the file name will be truncated to cchMax characters, including the ellipsis and the terminating NULL character. For example, if the input file name is "My Filename" and cchMax is 10, PathCompactPathEx will return "My Fil...". "C:\" is considered a directory. PathIsNetworkPath interprets the following two types of paths as network paths. Paths that begin with two backslash characters (\\) are interpreted as Universal Naming Convention (UNC) paths. Paths that begin with a letter followed by a colon (:) are interpreted as a mounted network drive. However, PathIsNetworkPath cannot recognize a network drive mapped to a drive letter through the Microsoft MS-DOS SUBST command or the DefineDosDevice function. Note The function does not verify that the specified network resource exists, is currently accessible, or that the user has sufficient permissions to access it. Returns TRUE for paths such as "\", "X:\", "\\server\share", or "\\server\". Paths such as "..\path2" will return FALSE. Returns TRUE if both strings have the same root component, or FALSE otherwise. Returns TRUE if the string is a valid UNC path, or FALSE otherwise. This function does not verify that the path points to an existing site—only that it has a valid URL format. TRUE if spaces were found; otherwise, FALSE. This function should not be used on generic command path templates (from users or the registry), but rather it should be used only on templates that the application knows to be well formed. Eh, the opposite of PathAddBackslash. If the file name does not contain an extension, the extension will be attached to the end of the string. Yes, the opposite of PathQuoteSpaces. A gimmick, but a simple one. The CRT function Clock returns the time since the process (application) was started. The time is presented as clock-ticks, which is in milliseconds. When running the application from IDE, the time returned by clock is the elapsed time since Team Developer IDE started. When running the application as executable (EXE), the time returned is the elapsed time since the executable was started. The good old SalTimerSet (SalTimerKill) function has one major drawback, it only supports timers up to 65535 milliseconds (65 seconds). The TimerSet function supports elapse times of 24.8 days (2.147.483.647 milliseconds). The usage is nearly similar to the SalTimer functions. 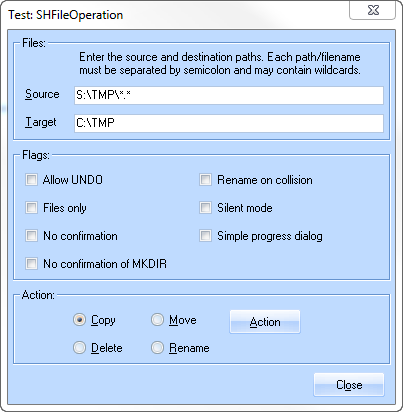 To get the path to a specific special folder you can use the shell function SHGetSpecialFolderPath. The sample contains a wrapper for this WinApi function. It returns the tick-count of the last input event (in msecs). Calculate the difference between the currrent tick count and the one from the function above. This is the idle time and depending on the value you can logoff or do other automated tasks. A string variable in TD can contain "normal" strings or any binary data (eg images, file contents etc). format the contents of a string variable to readable text depending on the used flags. 0000    4c 69 6e 65 20 31 0d 0a  4c 69 6e 65 20 32 0d 0a   Line 1..Line 2..
0040    21 21 21 21 00                                     !!!!. 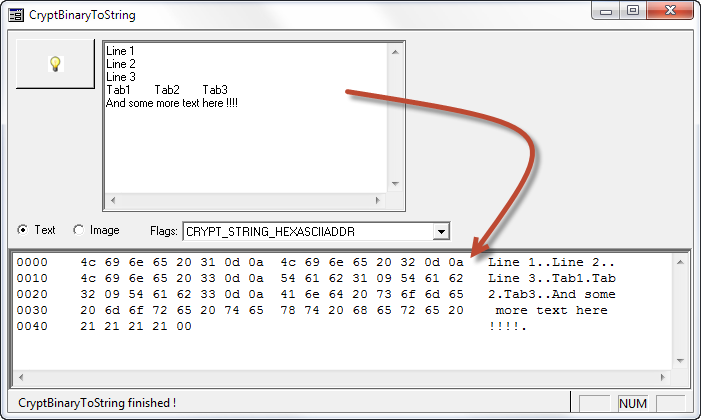 Here the HEX values of the bytes are displayed in blocks and also the ASCII representation of those bytes. The function also is able to convert data to other encodings like base64 in several flavors. 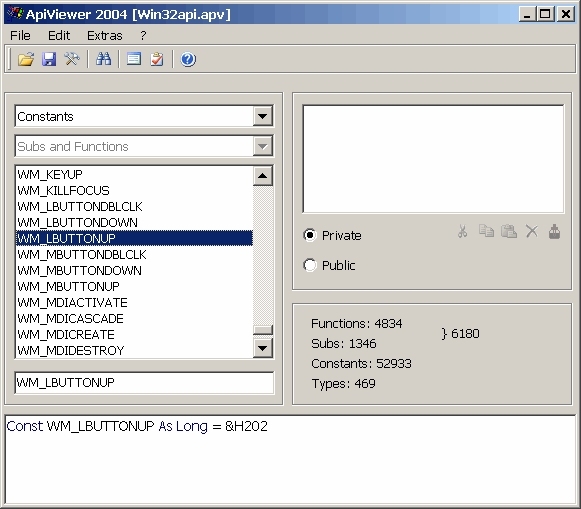 This could come in handy to create your own HEX viewer or to inspect any string byte contents. A TD wrapper function is created which calls CryptBinaryToString, named PALCryptBinaryToString. Converts a buffer to a formatted string. This function is placed in a separate library to be used in your own projects. This library also contains all WinAPI flag constants to be used in PALCryptBinaryToString. Here you can download a sample to show how to use PALCryptBinaryToString. Both ANSI and UNICODE versions are supplied. Team Developer offers several file functions, for instance to copy or delete files. When you need more advanced features, have a look at the WinAPI function SHFileOperation. Though most of these operations can be created using the standard Sal and Vis functions, this API function does it out of the box. the DLL's and DLL functions. If not, you are not able to compile your application in the first place. But what about the system your application is running on, at customer sites? on which Windows OS your application will be used by the customer. Or you use a third party DLL, which comes in several versions and you are not certain a specific version is installed on the deployment system. After this message, the application closes. To prevent this, you can check at runtime if a particular API function is present on the running system. Basically, it is getting a handle to the DLL and then getting the proc address of the function using it's name. The DLL is already loaded by your application. Most commonly used WinAPI dll's are. In the first case, the DLL is already loaded, the actions are the easiest. When nProcAddress is not NULL, the functionname was found. Beware that the functionname is case sensitive. You must supply the exact case to get the function address. The other situation, the DLL is not yet loaded by the application. For instance when a third party DLL is not yet called. The LoadLibraryEx function loads the dll from the search PATH. 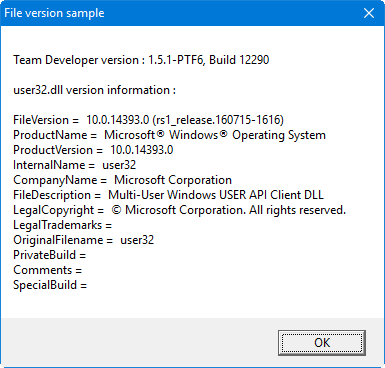 If you specify a full path, only that path is used to search the dll. 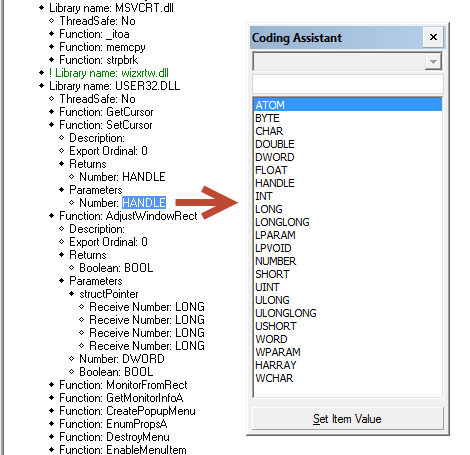 The DONT_RESOLVE_DLL_REFERENCES parameter will load the DLL without loading linked DLL's and does not initialise the DLL. If you are not sure if a DLL is already loaded, combine the GetModuleHandle and LoadLibraryEx. This function will first try to get the handle from the requested DLL and if that fails tries to load it. The several datatypes used in external functions have a predefined size. The next table shows the commonly used types and their sizes in bytes. The version information can also be retrieved programmatically. The sample provided here shows how to implement it in TD. It also offers a global function to retrieve the TD runtime version including the build number. The archive contains both the ANSI and UNICODE version. When implementing external function definitions, it is important to adopt the correct datatypes for return values and parameters. The datatype definition instructs TD to handle the data according to the intended bit/byte sizes and sign. Incorrect definitions can lead to datatype casting which transforms/cast the data in unexpected ways. The general rule is that you try to match the datatype definition exactly to the intended definition. For example, when a parameter expects an INT datatype, the TD definition should be set to Number: INT, obviously. Though you might come into doubt what to choose when the datatype is not explicitly one of the base datatypes, like INT or LONG. For example, Windows API functions could define other types, which are aliases or placeholders for the really underlying datatypes. Look at HBITMAP, which is a Windows API datatype. Team Developer does not have the option to set HBITMAP for exported functions. Reading the documentation of the function should indicate which base type it represents. Even then, in most cases it is searching all kinds of docs to find out which TD datatype to take. Personally, I still struggle to get the correct datatype, which takes time and in some cases, I accidentally use the wrong one. Therefore, I decided to make it a bit easier. I tried to get all base types and related Windows API datatypes into a list for future reference. The way to use it is: look up the API datatype in the list and determine which TD external function datatype to use. In addition, which CStruct functions to use to read/write the datatypes from/to buffers. Developers in TD are able to access (memory) buffers to read or write data directly. This is done using the CStruct library (cstructl.apl) which contains several functions for a limited set of API datatypes. For instance, using CStructGetWord, we can read a WORD value from a buffer. Using CStructPutWord we can write a WORD value to a buffer. However, looking closely at the CStruct library, it is striking that not all base datatypes have corresponding Get and Put functions. For instance, CStructGetWord, is defined to get only UNSIGNED values. This means that it only supports types having a maximum value range of 0 to 65535. A SIGNED value has a different maximum range, in this case -32768 to 32767. Most of the CStruct functions have this limitation. They are designed to handle UNSIGNED values only. When an UNSIGNED value is handled using these functions, the values will be truncated at certain values and result in strange values. To help out with these issues, I created an extension to the CStruct library, called CStructEx library. It offers many more functions for a wide range of different datatypes. The Ptr functions are using memory pointers (number) instead of string buffers. The API reference list shows which CStruct function to use for the particular datatypes. Library to use in TD70 and up (both 32 and 64 bit versions). The Speech Application Programming Interface or SAPI is an API developed by Microsoft to allow the use of speech recognition and speech synthesis within Windows applications. In general the Speech API is a freely re-distributable component which can be shipped with any Windows application that wishes to use speech technology. Simply said, using this API you are able to convert spoken text (eg audio from a microphone) to text within your application, called Speech to Text. Also, giving text to the engine creates spoken audio (computer voice) which is played through the speaker or saved to a file, called Text to Speech. A sample has been created in Team Developer to show how to use the API. Two versions are present: one for TD versions up to TD6.3 and one starting from TD 7.0. 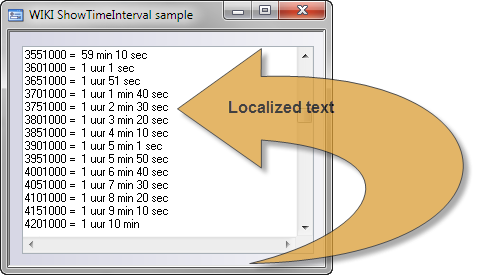 The sample shows both Speech to Text and Text to Speech implementations. This page was last modified on 9 January 2019, at 14:00.